Released 'as is' after being requested by Cocas for his very inventive F-32 'Joint Strike Fighter' early proposal this is a fictional Flygvapnet skin for F21. There is a slight limitation in that the nose insignia also appear on the inside of the aircraft but with your ejection seat in place you will hardly notice this. 1. From the AIRCRAFT folder drag and drop the F-32 folder into your main Aircraft folder and overwrite if asked. 2. 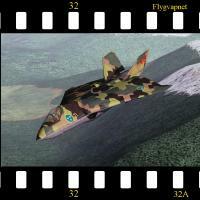 From the DECALS folder drag and drop the F-32 folder into your main Decals folder and overwrite if asked. As always, thanks to Third Wire for the continuous improvement of a great little game/sim. Thanks to the prolific and talented Cocas for bringing us this alternate version of the F-32. And, finally, thanks to everyone in the wider Third Wire community.